Becoming rich is nothing more than a matter of committing and sticking to a systematic savings and investment plan. If you want to get rich, start investing- and start as early as you possibly can. 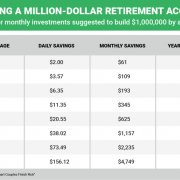 To illustrate the simplicity of building wealth over time, Bach created a chart detailing how much money you need to set aside each day, month, or year in order to have $1 million saved by the time you’re 65. Next time you consider running to Starbucks for a $4 latte, think about this chart and consider redirecting that coffee cash to your savings. Check it out here.